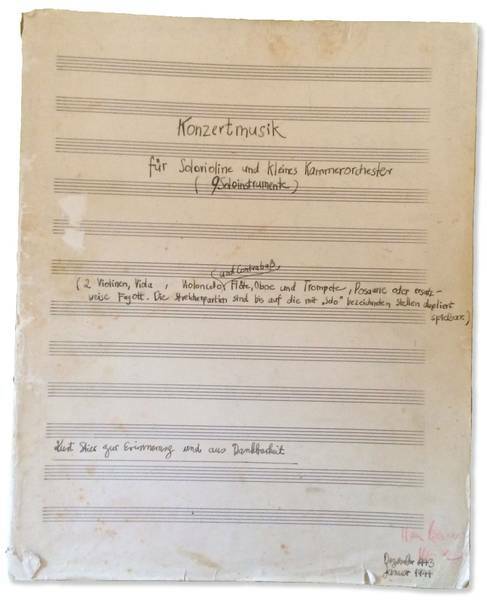 Concert music of 1944: The manuscript of Hans Werner Henzes opus 1: Concert music for solo violine and small chamber orchestra was handed over by Sibylle Stier to the Hans Werner Henze-Foundation in September 2017. The convocation of the parties to the Labor service and military service in January 1944 had at that time prevented a world premiere. 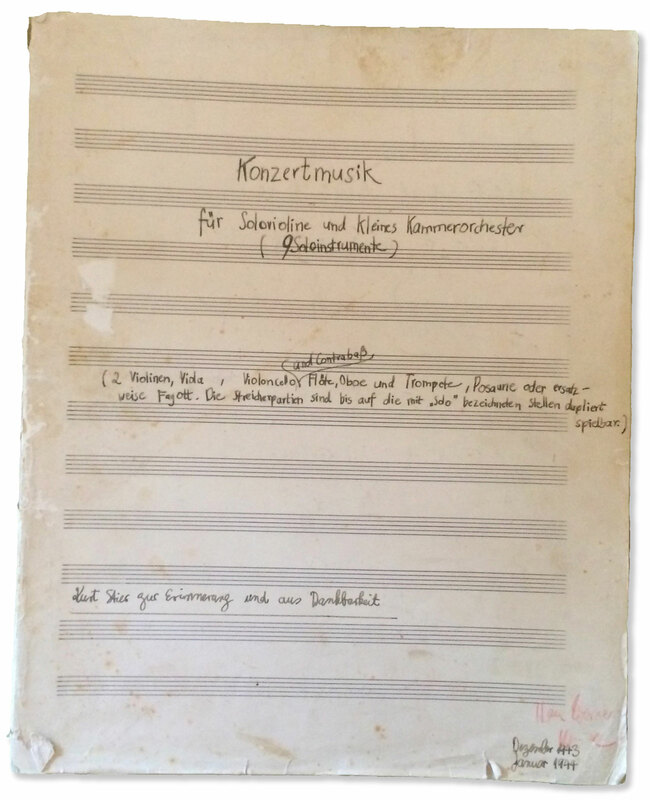 On September 25 the widow of the former concertmaster of the Bavarian State Orchestra, Kurt Stier, Sibylle Stier, handed over the manuscript to the managing director of the Hans Werner Henze Foundation, Michael Kerstan. It was a moving event, since this play is the first work Hans Werner Henze has ever released, so his opus 1. He wrote it at the age of 17, from December 1943 to January 1944, and it has been rehearsed in Braunschweig at the Staatsmusikschule with the remaining sixteen to seventeen-year-old students - Kurt Stier was casted as a soloist, the Orchestra consisted of 2 violins, viola, cello, double bass, flute, oboe, trumpet, trombone (or as substitute bassoon). The strings could have also been double occupied, if still available. Since the young musicians were recruited to labour or war service in January 1944, a public performance could no longer take place. To Kurt Stier, the violinist, who should one day be the concertmaster of the Bavarian State Orchestra in Munich I wrote a small concerto, whose manuscript is still in his possession today. He recently showed it to me in Munich, so I know how horrible it is. It has only once been played through by Kurtchen and the fellow students under my conduction during a lunch break in the „Washing-room“ – and has left the parties, including myself, quite cold. My compositional abilities were really still in their infancy.